Tinamous are one of the oldest families of birds. They are diurnal, meaning they are most active during the day. They are very shy and are rarely seen by humans. When approached, they hide in ground cover or heavy brush. Although they can fly, they rarely do, preferring to spend most of their time on the ground. They walk and run quickly. Most species roost, or sleep, on the ground, although a few sleep in trees. When a tinamou feels threatened, it will stand or crouch mo-tionlessly, or walk into heavy brush. When frightened, they will beat their wings and make a loud crowing or barking noise. As a last resort, they will fly low and for a short distance. Most tinamous are polygamous (puh-LIH-guh-mus), meaning they take more than one mate during a breeding season. The exception is the ornate tinamou, of which a single male and female pair off. For some species, the breeding season is year-round. For others, it is only during a four-month time period each year. At the start of the breeding season, a male will establish its territory and build a nest by digging a shallow hole in the ground, usually among trees or grasses. The male will call out to attract females. Usually, two or more females will respond and lay eggs in the nest. The male incubates (keeps warm until hatching) the eggs for seventeen to twenty-one days. A few days after they hatch, the chicks leave the nest and the male signals for new females to lay eggs. Tinamou eggs are among the most beautiful of all birds, coming in a variety of deep, shiny, solid colors, including red, brown, black, gray, olive, purple, sky blue, and bright green. 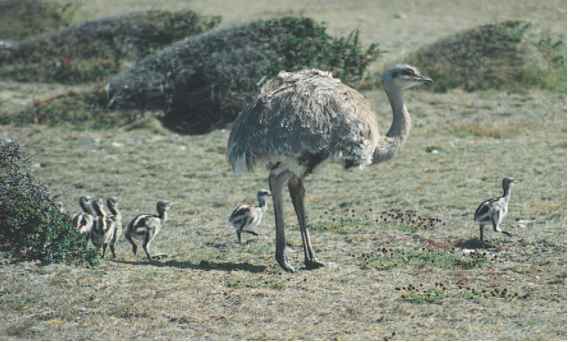 Nesting habits are not uniform among tinamou. The male variegated tinamou incubates a single egg while the male ornate tinamou incubates four to nine eggs from a single female. The ornate tinamou female aggressively defends the breeding territory, a task done by males in other tinamou species. The two most common species of tinamou are the variegated tinamou and the crested tinamou (also commonly known as the elegant crested or Martineta tinamou). They live throughout the open grasslands, or pampas, of South America. The Chilean tinamou lives in the tundra-like areas of the southern Andes Mountains in southern South America. It was introduced to Easter Island in the South Pacific in the late nineteenth century, where it still thrives today. Tinamous were imported into Europe and Canada in the early 1900s and raised as game birds, but domestication was not successful.